A charged particle is located on the ... axis with its velocity pointing along the ... axis. Another charged particle is also located on the ... axis, but with its velocity pointing along the negative ... axis. 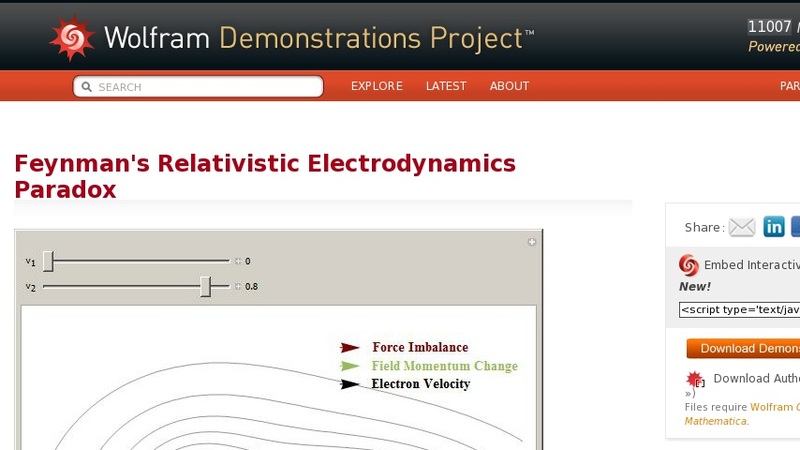 The net relativistic electric force on both particles is given by ... , where ... is the Coulomb constant, ... is the factor ... , ... is the charge, and ... is the position of the ... particle. The relativistic magnetic force of particle 2 on 1 is ... . The magnetic force of particle 1 on 2 is zero. The momentum of the electromagnetic field is given by the time derivative of the vector potential ... in the Coulomb gauge, ... . The sum of all three terms is zero and shows momentum conservation. The contour lines show the relativistic Liénard–Wiechert potential for each charge.